These two buildings will get a facelift, including brick work, with help from CARA. The corner of Ellsworth and Second in downtown Albany now looks mostly old and worn out. With help from the downtown urban renewal district, it soon will have a fresh appearance while retaining its old-time look. The Central Albany Revitalization Area (CARA) last week approved grants of $10,000 each to help owner Seth Fortier upgrade the outside of buildings at 202 and 206 Second Avenue S.W. The 202 address on the corner used to house the Tripp & Tripp real estate office. The store at 206 was long occupied by Jeff Senders’ stained-glass business. At the corner, the plans call for new awnings and new paint, along with caulking and so forth, at a total cost of $21,000. Next door, the owner will have contractors repair the brick and plaster walls on three sides and then paint them. The cost is estimated at $110,000. Christina Knowles of Varitone Architecture, also based downtown, did the design for both buildings. 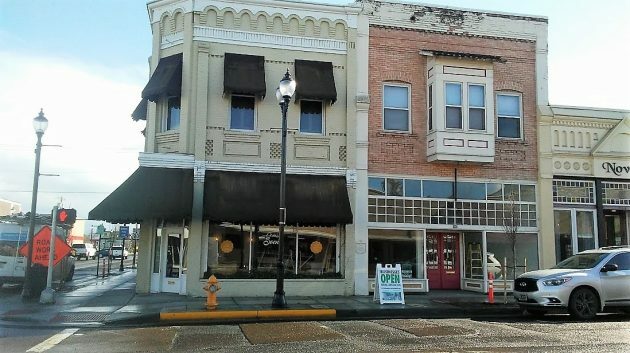 CARA has a program to help revitalize downtown storefronts, and the grants will come out of that part of its budget. Overall, CARA is ultimately funded by property taxes sidelined from other taxing units such as the city, county, school system, and community college district. Previously, last December, CARA approved a $50,000 five-year loan to business owner Jolene Wilson, who is working on opening a bakery and sprinkles factory in the former real estate office. I saw her painting shelves or something in there last week, knocked on the door and asked when the bakery would be open. She said it might be summer before cupcakes and other goodies will be for sale. CARA last week also approved a $5,000 grant to Daren Clowser, owner of the former Knights of Pythias lodge building at 230 Lyon St. S.W. He asked for help toward fixing up parts of the upper floor, where there are 14 apartments. Last year Clowser got a $10,000 CARA grant toward repairs and other work on the outside of the historic building. Bit by bit, the core of old Albany is being refreshed. It all goes along with the downtown streetscape project ($9.8 million at last report), which will be completed this summer. The amount of money that is being wasted in this town on cosmetics for the sake and benefit solely of business owners is an absolute disgrace. How about spending it on the actual residents. So unimpressed and disheartened with Albany. Yes. It feels like a bait and switch. Reverse Robin Hood schemes. I come back home and find that the place I served to protect all those many years ago has “evolved” from helping people in general to mostly helping businesses instead – even out-of-state ones. Sidelined? In the past I believe you’ve used a more accurate descriptor…siphoned. And the siphoning is done without the consent of the districts. Given that the legitimacy of CARA originates from Albany residents, can these same residents grant a power to city government that the residents themselves do not have? The answer, of course, is no. An Albany resident cannot legitimately take money from someone else without that person’s consent. Even if the law allowed said they could, it wouldn’t be right. Similarly, that same resident cannot legitimately empower city government to take money from another taxing district without that district’s consent. But CARA does this routinely. Call it sidelining, skimming, or siphoning, the effect is the same. This can only mean that CARA is illegitimate and morally bankrupt, regardless of what the state law says. I note the usual suspects whining & complaining about the progress Albany has made since the inception of the URD. And, no, they do not benefit just the downtown. To believe otherwise proves you have not done your basic homework. And, yes, Albany has “evolved.” In stasis we die. Period. I also note that Corvallis is now in process to acquire one. Kudos to Corvallis! Lebanon has one, etc., etc., etc.. Why? Because they work! If they didn’t, multiple[!] councils and advisory board members over the years wouldn’t keep working their plan[s] to benefit the community. CARA (or any URD) is a wise use of my tax dollars and will get my vote as long as I have the opportunity to use it. Spoken by one who has never missed an opportunity to try to raise our utility bills just so the City can charge us an extra 5% of it from franchise fees. Why is “their” cost of living increase is always more than what Social Security has determined to be “our” cost of living increase? Do you think it might be because Corvallis acquired a City Manager from Albany??? Of course Ray conveniently fails to mention that the Corvallis charter mandates voter approval of a URD. The election is scheduled for spring of 2019. At least Corvallis respects their residents. Can’t say the same for CARA, which was imposed on Albany residents by the city council. Thankfully, Albany voters voiced their dissatisfaction with CARA and the city council several years ago — voters now have the final say on every future URD in Albany. Nothing makes conservative mosquitos madder than a highly successful community program. I, for one, think the improvements to Albany downtown are a huge plus for our entire community. Out of town guests have been impressed with the services and appearance of our city. These improvements help all of us, even those of us who don’t live downtown. I say more power to CARA and our leaders. Yes, stupid CARA has made my life more difficult. For example a couple weeks ago when my friends were in town we had to decide which of the many fine restaurants downtown to enjoy. And we walked. Both ways! On safe sidewalks. Gone are the good old days of a few bland chain restaurants by the mall and freeway that one would drive to because there was not all the choices that we have now. Oh and the “Society for the Continuation of Empty Storefronts” (SCES) would also like to remind you of how great downtown use to be for those that get a kick out of seeing empty storefronts. Comparing the downtown areas of Corvallis and Albany over the last 15-20 years, I think it is clear from an objective viewpoint that Corvallis has done a much better job and apparently without an URD. I am always drawn more to Corvallis downtown events due to its more vibrant, open, and family atmosphere than Albany’s. Why Corvallis wants to have an URD when success is already visible is beyond me. Downtown areas can be made viable and thriving without URDs. No homework required other than to believe your eyes and see what Corvallis has done without an URD. Let’s see… Run for office. It’s called elections. We’ve had 8+ full election cycles for councilors since the inception of the URD – by your elected representatives. I’d say that demonstrably proves you’re on the wrong side of this issue. So, yes, I’d definitely state you’re still whining since you can’t garner enough support through the tried & true process by which the city makes decisions. The negativity of the locals towards the revitalization of downtown astounds me. I understand the frustration of certain issues not being addressed as quickly as some think they should be. But the fact is you cannot put the progression of the community on hold over the objections of a few who believe that all revenue should go solely to to the concern of their choice. Revitalization, improves the local economy, stimulates tourism as Albany, quaint as it is, will be appreciated by those of us who have a passion for things historical. Assisting businesses create jobs, reduces unemployment, helps to curb crime, along with limiting access to vagrants who like to squat in unoccupied buildings. I have family in other states that when they visit I would like to show them around and give them a chance to appreciate the local culture. Personally I think the council has taken the right steps in moving Albany foward. They have vision, something that seems to be lacking for some posting in here. As for the lights, I myself question the cost of purchase and installation, but then again as a former lineman, the cost of service is justified, by labor, insurance and so forth. Complaints? My gosh, I don’t know what the pioneers were thinking when they planted themselves in Albany. They were interested in vibrant Hub City.